William "Wild Bill" Cantrell was born in West Point, Kentucky on January 31, 1908, and according to Bill, his roots to boat racing began somewhere 'Wayback in the 1920's when he showed up and they slipped a jacket and helmet on him and he went for a ride as the boat's riding mechanic. Then one day the driver didn't show up and the rest was history! As the moniker "Wild Bill" was reportedly affixed upon him after a boat he was piloting went out of control and plowed into moored spectator launches anchored on the Ohio River! Cantrell came to national prominence in 1939, when his (725-class) Why Worry of the "Haywire" class, denoted by the more affluent American Power Boat Association's (APBA) Gold Cup entrants - convincingly won all three heats as the support class at that year's Detroit River's Gold Cup event. His performance was so dominating that it deserved inclusion into the B-I-G' SHOW! Becoming the first time that 7-litre craft participated in the Gold Cup. As Cantrell's mount would lead two heats but suffered propeller damage both times, dropping him out of contention. Ironically, also part of the Detroit's Haywire armada was some Dude named Fageol in one of his many Ventnor commissioned Hulls named So Long, albeit Fageol wasn't chosen as the other of the two 725-class boats picked by fellow competitors to represent their Haywire class in the Gold Cup, having withdrawn prior to its commencing. When not on the water, "Wild Bill" - not to be Cornfuzed with Willard Cantrell, known as the "Silver Fox" who won over 150 Midget & Sprint Car victories - like many other aspiring racers, also drove Midget Cars in the Depression era (1930-40's) and was precluded from military service in WWII due to having endured a broken neck during an Evansville, Indiana Midget race in 1941! Nineteen forty eight was a heady year for Wild Bill, who not only was hired to drive the B-I-g' BOATZ, nee Unlimiteds, aboard My Sweetie, but also made his debut in America's most prestigious motor race. At the spry age of 40, Bill earned his rookie stripes upon debuting at Mother Speedway, driving an somewhat unconventional Fageol Twin Coach Special, which naturally was powered by a six cylinder bus engine. Although not nearly as radical as the team's previous entry, the twin engine Supercharged Offy's driven by Paul Russo in '46! 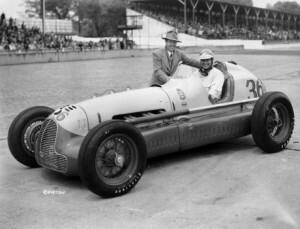 Cantrell qualified an excellent seventh for the 1948 Indy 500 - the top starting Rookie, and reportedly ran in sixth place for much of the race before faltering to 16th due to steering issues. As I find it fascinating that drivers had to be Invited to race at the Speedway back in the 1940's! And while the My Sweetie was unbelievably fast in '48, it had a tendency to leap out of the water - later attributed to its steep propeller shaft's angle, as Cantrell would flounder in all three races he contested that season. Famously quipping that the boat would be better suited to a Steeple Race than Boat race! Although Cantrell would attempt qualifying for Indy more than twice, with failed bids in 1951-52. Although reputedly relief driving for the unheralded Bayliss Levrettduring the 1950 Indy 500 notorious for its oppressive heat. Bill made his second and final start at Indianapolis in 1949, this time driving the Kennedy Tank Special. Starting a disappointing 30th and finishing 21st after retiring with a Driveshaft failure. Yet Wild Bill would have his breakout season in the Unlimiteds, after the boat's shaft angle was redesigned, My Sweetie would be the dominant hull on the water the entire 1949 season. As Cantrell not only won the prestigious Gold Cup, but would go onto become that year's National High Points Champion en route to winning five of six races that year. Meanwhile, Lou Fageol, having become president of Fageol Twin Coaches and still an avid boat racer was testing his mettle aboard his newly created So Long, one of several boats he raced, having sold his previous So Long Jr. propelled by the first of many (seven liter) Fageol Coach Works bus engines, as the 7-litre class was specifically created for these hulls. With Fageol being one of the ten competitors taking part in the prestigious 1949 APBA Gold Cup - while a 20yr old driver named Bill Muncey failed to qualify! Lou finally graduated to piloting an Unlimited late that season after giving up upon his line of So Long boats when first racing Miss Such Crust II for Jack Schaeffer - before finishing out the year in Miss Such Crust I, aboard which he defeated "Wild" Bill Cantrell's dominant My Sweetie with Horace Dodge, Jr. relief driving for a single heat. As Horace Dodge Jr. was the son of Horace Eldrige Dodge, one of those "Dodge" Brothers who started a Car company 'Wayback in 1915 that Y'all might know as Dodge today! Lou Fageol then drove for the injured Cantrell the following season in My Sweetie, where his "relief" driving so impressed Stan Sayres, that he was hired originally to relief drive a Seattle legend, the Miss Slo Mo-Shun IV in the prestigious Harmsworth Trophy race after the boat's designer and original driver Ted Jones became injured - which Fageol promptly won! In 1955 Lou would survive the sport's first Barrel-roll "Blow-over" aboard the Slo Mo Shun V on Lake Washington during Seafair! Fageol then retired from driving before dying from a heart ailment in '61. Wild Bill who was always a Fan favourite in Seattle despite his Detroit bias - during the Detroit v Seattle era, especially with kids - famously gave a 7yr old boy longingly looking thru the chain link fence at the Seattle Pits a personally guided tour after hoisting the lad over the fence. His name was Chip Hanauer, who would go onto become the sport's third winningest driver ever! And Art Oberto, longtime sponsor of the multi-times National Champion Oh Boy Oberto Unlimited Hydroplane has an entertaining connection to Messer Cantrell. As it was Wild Bill whose Gale IV went out of control during the '54 Seafair Regatta upon experiencing rudder troubles - and ran aground and ultimately beached itself in a Rose Garden! To which Cantrell famously quipped: "That's the first time I've ever walked Home from a Boat race!" As the waterfront home in question is currently owned by The Oberto's. After driving My Sweetie for Horace Dodge, Jr. for three seasons, Bill moved to race for Jack Schaeffer's potent Such Crust Hydroplane's before the team temporarily ceased competing due to financial difficulties. Yet Cantrell was too good of a driver to be left on the sidelines and was immediately snapped-up by the owners of the Gale Enterprises boats, Joe and Lee Schoenith, for whom he'd stay employed thru the remainder of his driving days, before leaving Gale Enterprises after two-plus decades of employment. Bill would win countless more races - and ultimately go onto win a second National High Points Championship in 1963 before his racing days came to a close in '68. In 1971 Wild Bill told APBA Historian Fred Farley that the highlight of his colourful Hydroplane racing career had been winning that lone Gold Cup victory, while Cantrell settled down in Madison, Indiana and opened up a machine shop along with becoming a winning Unlimiteds' owner, being inducted into several Hall's of Fame before passing away at the age of 87 in 1996.